We are fond of capsicum (better known as bell pepper in North America) and I make this fairly often. 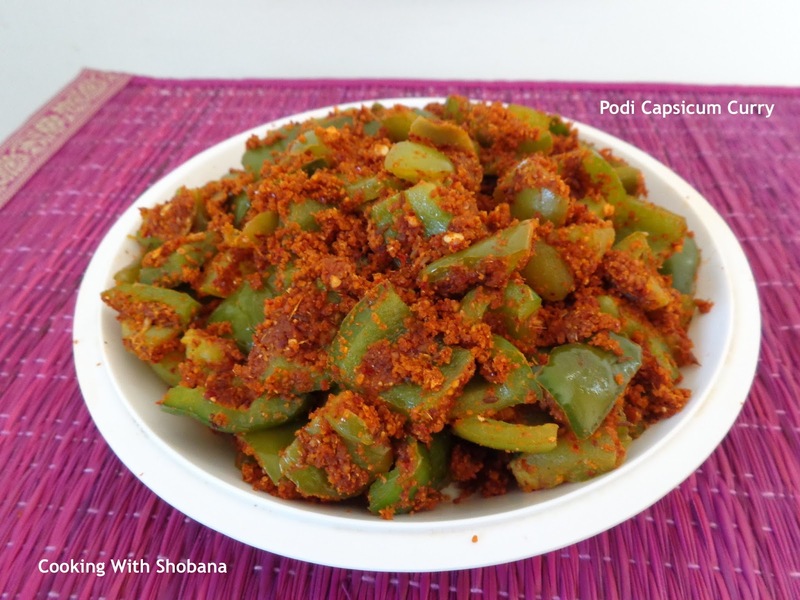 Not surprisingly, therefore, you will find numerous dishes made with capsicum in this blog such as Mushroom & Bellpepper Stir Fry, Besan Wali Simla Mirch, and Capsicum & Potato Kairas. Saffola cooking oil has been a household name in India for many years. Today's recipe gets it's name from the spice mix (freshly ground mix) or podi used with the capsicums. This has been adapted from Podi Capsicum Curry from Saffola Fit Foodie website. We use just 1 tsp of oil and this recipe is part of their series of Healthy Recipes. You can use either Amchur or Tamarind Paste for this dish. I used the latter. Take care not to dry roast the ingredients for spice mix on high heat. Use medium heat instead. Wash and de-seed the capsicum and chop them into 1" squares. Keep aside. Allow them to cool, transfer to a mixer and grind them, using pulse mode to a coarse powder without adding any water. Keep aside.